Though Manny Pacquiao has been around as a pro for a good deal longer than Amir Khan has been punching for pay, both men are coming towards the end of their careers. And before he hangs up the gloves Khan so much wants to lock horns with his old gym-mate and sparring partner. Pacquiao seems to have rejuvenated his career in a pretty big way with his recent KO win over Lucas Matthysse to claim a secondary belt at welterweight, while Khan, on a far grander level, got his own career back moving again with his quick blow-out of Phil Lo Greco. 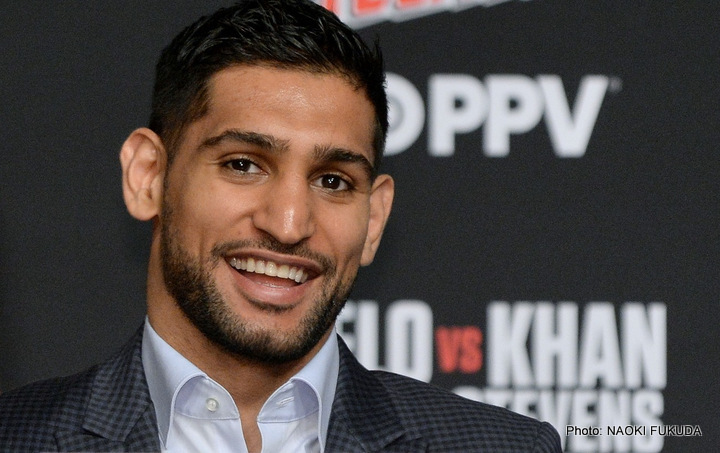 Now, in speaking with TMZ, Khan – who will face Samuel Vargas in his second comeback fight, next month – said he is willing to “put friendship aside” in order to fight the all-time great. Even now, all these years into their respective careers, this fight has an appeal to it. For one thing, it would be speed Vs. speed. Also, neither man, whether he has won, lost or drawn, has ever really been in what you could call a stinker of a fight. Khan, for all his faults, always comes to fight and he is always great value for money. Pacquiao, who has less faults than his younger would-be rival, has been exciting us all for over twenty long years. Put them in a ring together, for real (Khan says he did well in the closed spar sessions he and Pacquiao engaged in years ago) and you really do have a guaranteed exciting fight. Who wins? Pacquiao has to be the pick, even as he closes in on his 40th birthday, but Khan would be super, super-motivated. Khan has way more to gain and Pacquiao has way more to lose. Will this fight actually happen?